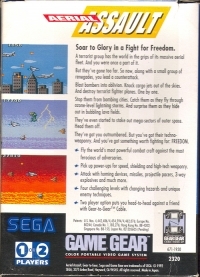 Box Text: Soar to Glory in a Fight for Freedom. A terrorist group has the world in the grips of its massive aerial fleet. And you were once a part of it. But they've gone too far. So now, along with a small group of renegades, you lead a counterattack. Blast bombers into oblivion. Knock cargo jets out of the skies. And destroy terrorist fighter planes. One by one. Stop them from bombing cities. Catch them as they fly through ozone-level lightning storms. And surprise them as they hide out in bubbling lava fields. They've even started to stake out mega-sectors of outer space. Head them off. They've got you outnumbered. But you've got their techno-weaponry. And you've got something worth fighting for: FREEDOM. Fly the world's most powerful combat craft against the most ferocious of adversaries. Pick up power-ups for speed, shielding and high-tech weaponry. 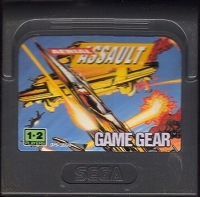 Attack with homing devices, missiles, projectile pacers, 3-way explosives and much more. Four challenging levels with changing hazards and unique enemy techniques. Two player option puts you head-to-head against a friend with Gear-to-Gear Cable. 10-03-2011 byron Box Text Soar to Glory in a Fight for Freedom. A terrorist group has the world in the grips of its massive aerial fleet. And you were once a part of it. But they've gone too far. So now, along with a small group of renegades, you lead a counterattack. Blast bombers into oblivion. Knock cargo jets out of the skies. And destroy terrorist fighter planes. One by one. Stop them from bombing cities. Catch them as they fly through ozone-level lightning storms. And surprise them as they hide out in bubbling lava fields. They've even started to stake out mega-sectors of outer space. Head them off. They've got you outnumbered. But you've got their techno-weaponry. And you've got something worth fighting for: FREEDOM. Fly the world's most powerful combat craft against the most ferocious of adversaries. Pick up power-ups for speed, shielding and high-tech weaponry. 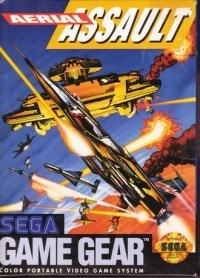 Attack with homing devices, missiles, projectile pacers, 3-way explosives and much more. Four challenging levels with changing hazards and unique enemy techniques. Two player option puts you head-to-head against a friend with Gear-to-Gear Cable. This is a list of VGCollect users who have Aerial Assault in their Collection. This is a list of VGCollect users who have Aerial Assault in their Sell List. This is a list of VGCollect users who have Aerial Assault in their Wish List.